This female-dominated, modernized reboot of the 1984 hit film “Ghostbusters” will disappoint fans as it is nothing more than a mediocre remake. 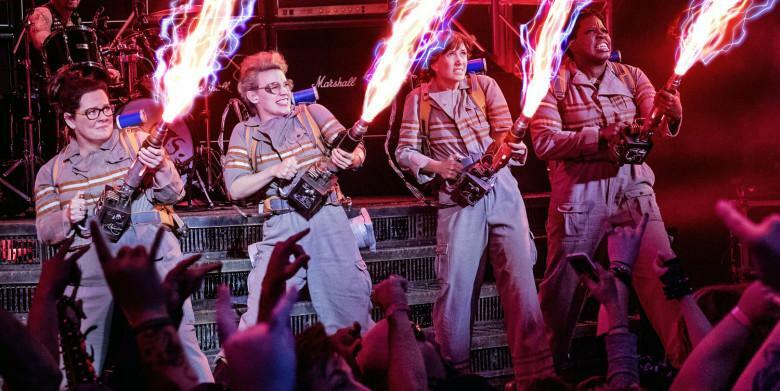 Paranormal enthusiasts Abby Yates (Melissa McCarthy) and Erin Gilbert (Kristen Wiig), genius engineer Jillian Holtzmann (Kate Mckinnon), and subway worker Patty Tolan (Leslie Jones) replace the original male Ghostbuster crew, which caused online debate before the movie was even released. Despite the public’s low expectations, “Ghostbuster” earned $46 million in the first weekend. The 2016 “Ghostbusters” follows the four women and their handsome but dim secretary, Kevin Beckman (Chris Hemsworth), as they investigate New York City for ghost sightings. They document their first case inside a haunted mansion, then develop more advanced ghost-catching equipment as they set up their business and research lab in the second floor of a Chinese restaurant. In a slightly different rendition of the original ambulance, the quartet get their hands on a funeral hearse courtesy of Patty’s uncle, which they completely redecorated as their own — complete with their trademark logo — and strapped their nuclear equipment on. Their stunts are set to a modernized cover of Ray Parker Jr.’s “Ghostbusters” classic theme song, performed by Fall Out Boy and Missy Elliot, as they weave through New York traffic with flashing lights and squealing tires to chase after ghosts. Eventually, they successfully capture a ghost with their proton packs and a ghost containment trap, but are still labeled as frauds even after posting their evidence online. The ghost crisis escalates and climax in Times Square, where the women fight to save New York City from an army of ghosts and close an opened portal to the realm of the undead. The script was uneven; funny at some points, flat at other times. However, the characters’ quirky personalities, from Patty’s sassy energy to Jillian’s eccentric ideas, clicks perfectly and highlighted their humor as the band of misfits working to research and combat the paranormal. Additionally, the special effects accompanying their many paranormal encounters are heavily overdone and not particularly well executed. It dragged down the repetitive action scenes of fighting ghosts that quickly became less exciting with each slime drenched encounter. The 2016 “Ghostbusters” also brought back many of the monsters from the 1984 version, including a car full of Slimer’s buddies and an upscaled Marshmallow Man smashing through the city. The plot was entirely predictable, especially the ending fight scene. The ease in which the Ghostbusters found a convenient solution and annihilated the army of ghosts left little room for surprise. Despite the shortcomings of this summer blockbuster, there is something undeniably fun about watching the Ghostbusters gleefully chase after ghosts. The 2016 “Ghostbusters” is not as downright terrible as some fans have claimed, but it is only a passable remake of a comedy classic.